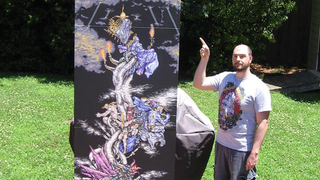 8-Bit Artist spent more than 200 hours on this painting, just to prove how insanely huge and incredible Kefka, the final boss of Final Fantasy VI, is. Here's the full, 9 feet tall acrylic painting with all of its 111,747 pixels. Terra, Locke, Sabin and all the others would be so tiny compared to this beast. This is 8-Bit Artist's latest piece, but there's a lot more on his Facebook page.